KFC’s latest internet sensation – is a giant Colonel Sanders shaped cat toy tower. The ‘Colonel Sanders Cat Climber’ features in the fast food brand’s latest Facebook Live campaign. Online entertainment website Super Deluxe hosted a four-hour livestream event featuring the bizarre contraption. The cat climber features drumstick toys, a spinning cane, a moving mouth, laser beams for eyes and eyebrows that move up and down. According to The Drum – around 1m viewers tuned into the spectacle, with 700,000 watching live and another 400,000 watching the recorded version. But this is no one-off stunt. In the highly competitive food-on-the-go market the challenge is to drive consideration continuously. At Cannes Lions this year KFC U.S’s Director Of Brand Communications George Felix and their agency ECD Jason Bagley (of Wieden Kennedy) told of their strategy for “branded everything” which resulted in a mind-blowing 1,850 pieces of content in the past 12 months. From TV spots, to Twitter content – everything’s crafted to drive coverage and conversation. 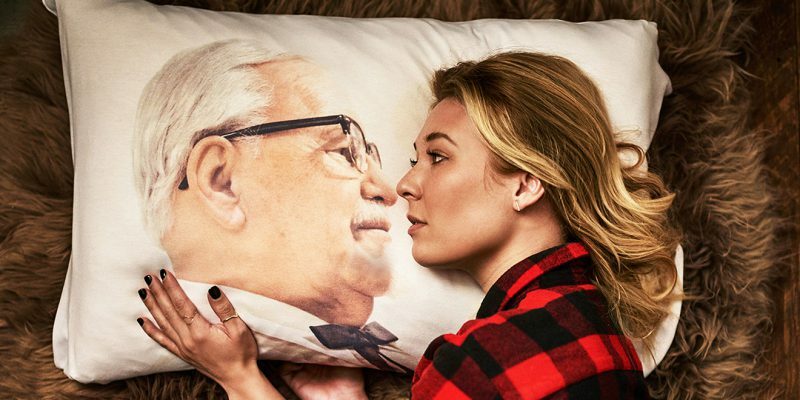 From bizarre dishes and weird merchandise lines (Colonel Pillowcase anyone?) to attention grabbing publicity stunts the chain are consistently knocking their rivals out of the social media spotlight. It’s always self deprecating, it’s always entertaining and it never strays into self-serving marketing BS. Let’s take a look at some of the hits. In 2015 they brought their grey-goateed mascot Colonel Sanders back out of retirement. But rather than wheel out some lame costume character to do the job on TV – they in brought well-known actors to don the white coat and become the Colonel, including the likes of Rob Lowe, Ray Liotta, Billy Zane and Reba McEntire. 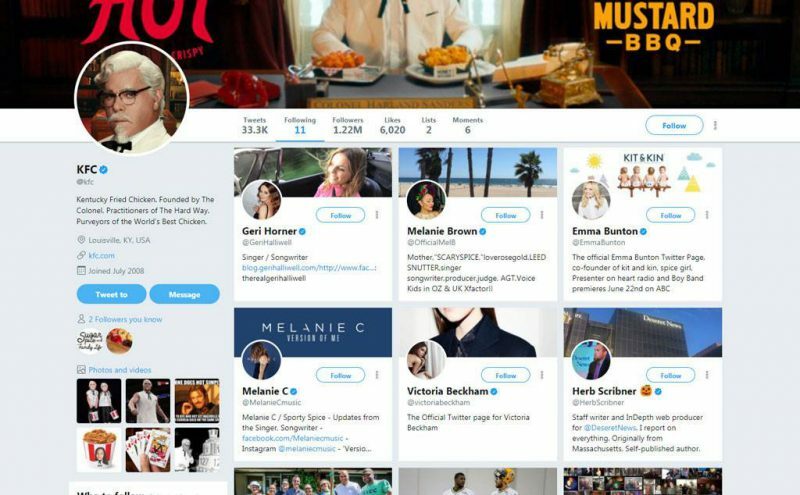 So far a carousel of 11 different celebrities have ‘played the Colonel’ – each bringing their own unique comedic take. Edgette was publicly thanked by KFC for noticing the pun and for making their twitter account go viral. In the UK KFC takes a swipe at clean-eating, clean-living food bloggers with a campaign to promote the ‘KFC Clean Eating Burger’ on its social media accounts. Fronted by “Figgy Poppleton-Rice,” it’s a witty parody of nu-food influencers. 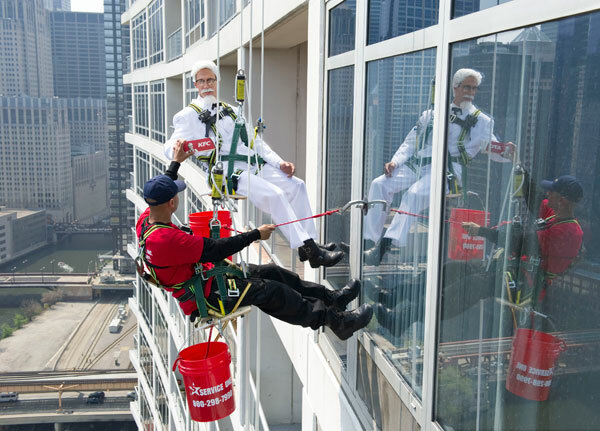 In Chicago a man dressed as the Colonel abseiled down the city’s River Bend building. Rappelling down the 40-story building – he handed out free meals to window cleaners. 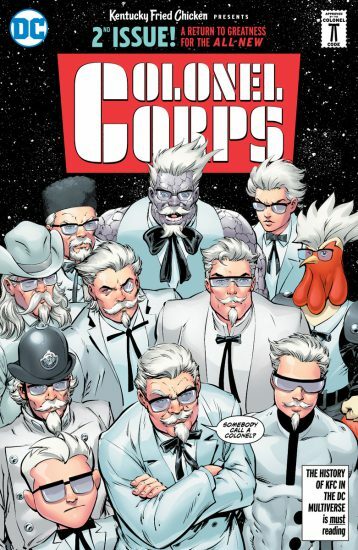 The brand partnered with DC Comics with a special issue that featured Justice League characters and Colonel Sanders fighting side-by-side to protect the universe and defend the name of everyone’s favourite fried chicken expert. Ahead of Mother’s Day they released “Tender Wings of Desire,” an 83-page romance novella about the budding relationship between Colonel Sanders and a young, rebellious woman named Madeline Parker. The brand took its motto of “finger lickin’ good” food to a literal extreme by debuting edible nail polishes in Hong Kong. The polish came in one of two flavours – original or hot & spicy. Inspired by the trend for ‘stocktails’ – meaty craft cocktails made with broth and booze – KFC brought them to masses with its own take on three classic cocktails; The Gravy Mary, The Finger Lickin’ Sour, and The Southern Twist. Their UK chicken shortage apology has become an award-winning case study in the art of saying sorry. The company has a long history with creating attention-grabbing stunts. In 2006, to promote its new logo, KFC decided to make its marketing as visible as possible — with a logo so big it could be seen from outer space. The creation was placed in the Mojave Desert not far from Area 51, the fabled UFO-famous Air Force Base. So there you have it. KFC brand communications.